Gill mentioned recently a childhood memory, of “Overnight Rolls”. She wanted to try and make something that emulated this treat from her past. I Googled and I found this: Bread for Breakfast and passed the link to her. Then I got to thinking, why not? I threw the dough together last night, raising on eyebrow at the quantity of salt as I doled it out regardless. 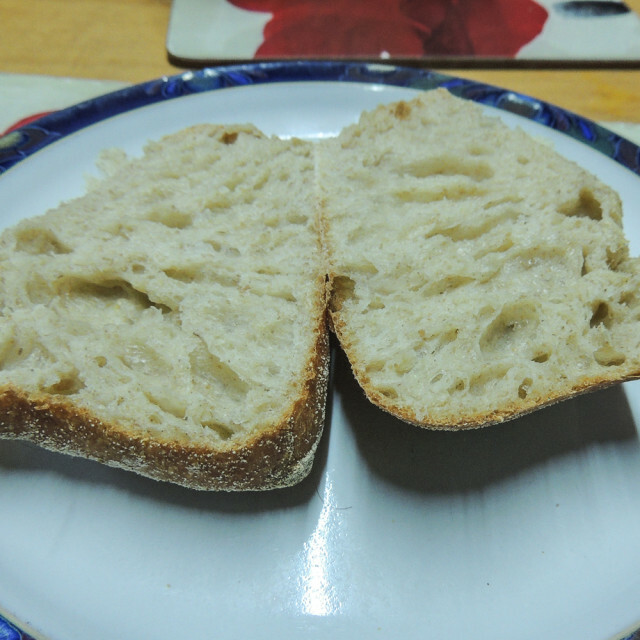 I shan’t reproduce the recipe (follow the link) but basically you just throw together the flour(s) and salt, into the water in which the yeast has been dissolved. The amount of yeast is tiny – just 3g if using fresh, 1g for dried. Just mix until the flour has taken up the liquid. No kneading. The recipe says to leave the dough overnight at room temperature. I did this with some misgiving – “room temperature” is not a real concept in my kitchen at this time of year. My kitchen yields refrigerator temperature. Nonetheless, the dough had more than doubled by the time that I rose this morning. Mr L brought a drink back to bed, and I hopped out before having mine, to tip the dough out and do the quick folding procedure – again, there is no kneading, just four stretch-and-fold manoeuvres. I headed back to bed, having switched the Rayburn on in the hopes of encouraging the dough, which is supposed at this stage to rest for 45 minutes. Frankly, it felt icy to my touch and I feared that 45 minutes would be nowhere near long enough. After half an hour, morning mug now drained, I switched the oven on to heat my baking stone, and headed off for my shower. Freshly abluted, and now properly dressed, I cut the dough into 8 pieces. This was a dodgy procedure all round and next time I shall use something sharper than my plastic dough scraper and/or introduce some flour to the operation. Wet and sticky dough – be warned! The recipe suggests putting the rolls onto baking parchment for transfer to the oven. I, of course, failed to trace an outline of my pizza stone before heating it and had to guesstimate the placing of my (wet and sticky, remember) rolls. So between the sticky “cutting” and the cack-handed manipulation, I ended up with a variety of sizes of oddly-shaped rolls. 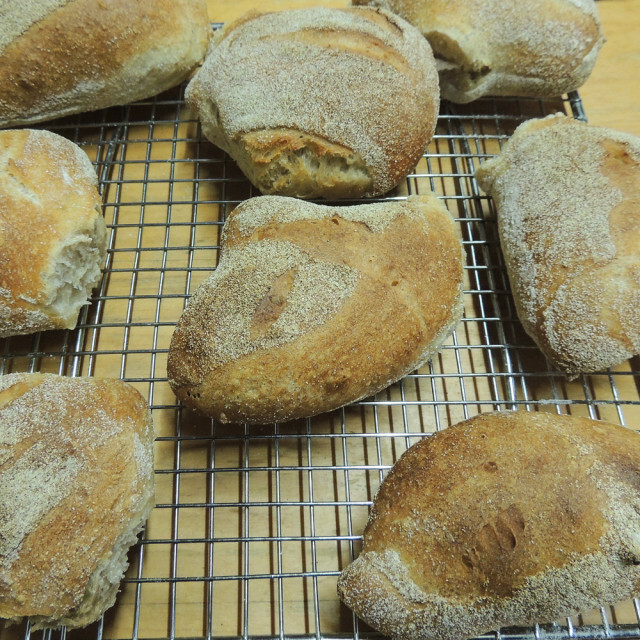 I used semolina flour to cover my baking paper and to coat the tops of the rolls. I also attempted to slash the tops, not with any great success. At this stage I was formulating a backup plan for breakfast. They did rise and felt quite light, with a really pleasantly crusty crunchy feel to them. Not as great an oven spring as I would have liked – I put this down to the extremely cold temperature of the dough defeating the oven’s heat. Inside, the texture was pleasantly chewy. Lots of large holes, looking something like Ciabatta. 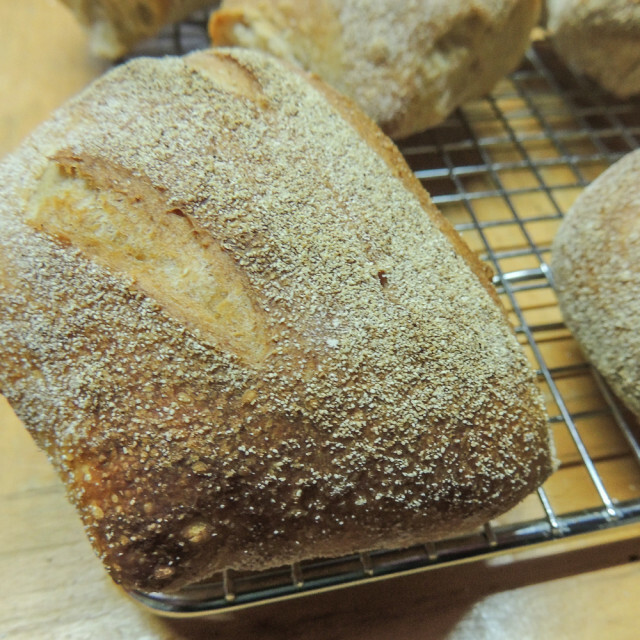 The golden colour comes from the small quantity of wholemeal flour used in the blend. The flavour? Not ‘arf bad. They’re tasty, very tasty. The beauty of baking these fresh for breakfast, is that the bacon can go into the same oven and everything is ready at once. Dry cured smoked streaky from our local butcher. 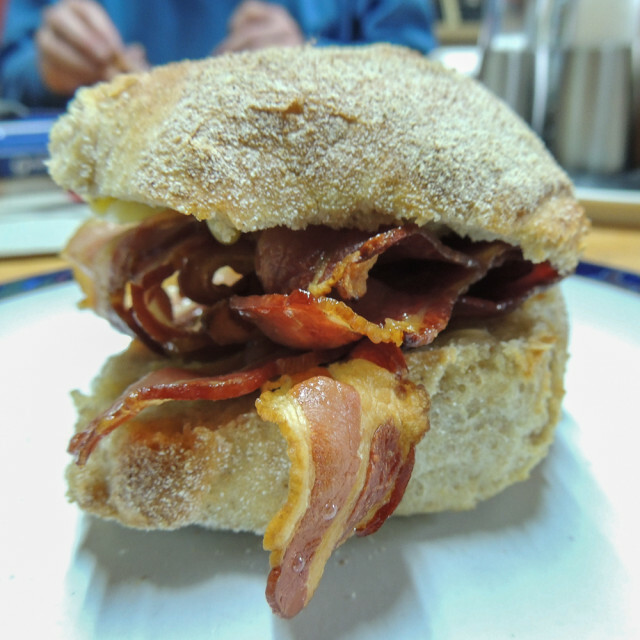 Fabulous sarnies. Just for completeness, I had a second roll with butter and marmalade – next time I will cut back on the quantity of salt in the dough, it is far too much but, yes, they are also good with marmalade. Verdict – I’ll do them again. Only I won’t leave the dough in the kitchen. I shall either use the electric proofer on its lowest setting, or I shall move the bowl up here to my studio, where the server is left on overnight. I might just try that out tonight, in fact. The remainder of this morning’s batch is about to be turned into garlic bread to have with today’s pasta experiment. And, with that, I must leave you and go mix up my pasta dough.